How would you like to get your message out to 4.6 billion people? That’s the number of mobile devices out there today, and each and every one of their users could be a potential customer. From texting to tagging to custom applications, there are numerous options for businesses to communicate to consumers with personalized messages, location-based promotions and discounts, and mobile barcodes for instant access to related content — to name a few. 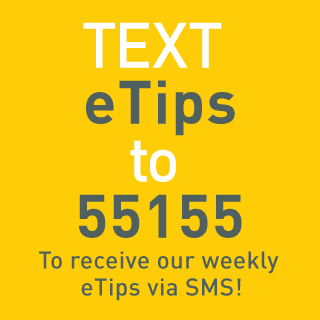 Perhaps it’s time for you to trade your email list for an SMS list. But before you start ramping up your mobile efforts, it helps to understand the different technologies that are available. 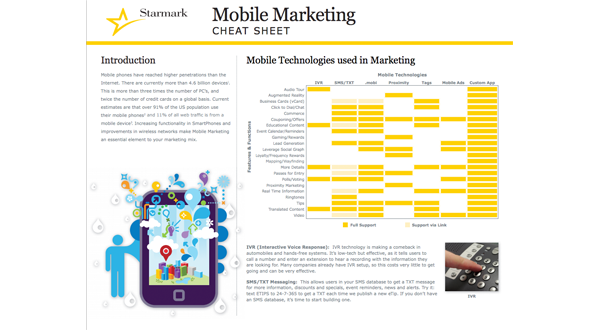 This is the third “Cheat Sheet” in a series produced by Starmark. If you like what you see, please also check out our Twitter for Business Cheat Sheet, and our Social Bookmarking Cheat Sheet.